After the Electrical Exhibition closed in October 1908 the City Council started a programme of public works to relieve severe unemployment and the subsequent distress. The Platt Estate grounds were in a poor & un-drained condition. Gore Brook was carrying large quantities of sewage which lay on the brook side and was foul smelling. Through the winter some 720 men laboured in the park. They had been chosen from The Corporation Employment Registry, preference being given to men with families. These 'Distress Works' cost £50,000.00 and stopped in April 1909. Further work was needed to make the park grounds safe for the public and this commenced in May. Altogether 56 acres were drained, the brook was lined with brick so that any future waste would be carried away, 3.5 miles of footpaths were constructed, nearly 40 acres of turf laid, trees & shrubs planted and the boating lake built. This involved excavating earth over 6.5 acres, piling most of the waste in the centre to create the 1acre sized island. Finally the park was safe for the public to use. There were extensive areas for playing games and a pond for children. A new road was built, called Grangethorpe Road and this was the principal access to the Park & Lake. The paragraph below is taken from the Souvenir Opening Programme. 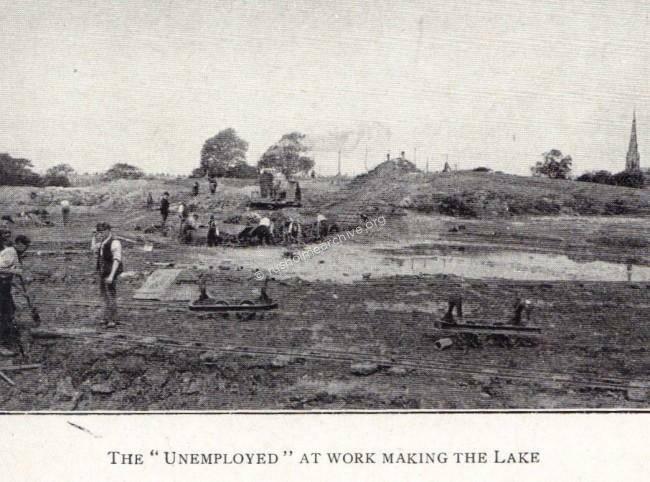 Below are two more photographs of the Lake under construction 'Click' to view, remember to press the 'back' button on your browser to return to this website.